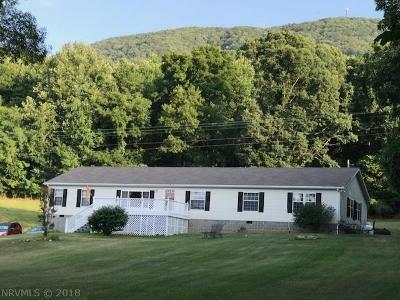 What an Amazing 3 Bedroom/2 Bath Home Nestled on 7.89 Acres in Pearisburg! Everything on One Level. This Home is Very Well Maintained with 2280 Sq. Ft. along with Tremendous Mountain Views and a Beautiful Landscaped Yard. Showcasing: Tasteful Interior Colors, Enormous Kitchen with Island, New Tiled Backsplash, Tons of Counter Space, Glass and Wood Cabinets, Dine In Area, Family Room with Gas Fireplace, Ceiling Fans Throughout, Wood Floor Laminate, Carpet, Master Bath with Dual Sinks, Shower, Tub, Glass Cabinet. Other Attributes are, Water Softener, Lattice on Front and Back Decks. Take in Nature to Relax and Slow Down Plus enjoy the Woods for YOUR Privacy . Just a couple of minutes to Downtown Pearisburg where Shopping, Restaurants, and Recreation Awaits You! Downtown Blacksburg is just 33 minutes Away! Directions: From Downtown Pearisburg Take Wenonah Ave Turn Right On S.main 100. Go Right Then Left On Johnston, Right On Morris/Cross And Go About 1.5 Miles Property On Left.